Searching for that special, quiet beach vacation haven? You’ve found it at The Crescent! 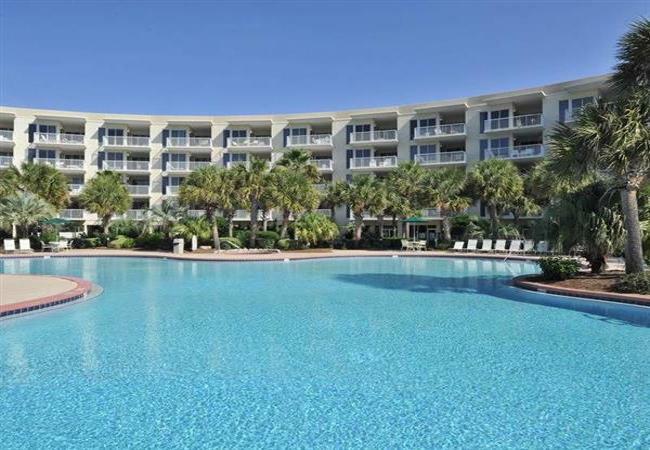 Located directly on the Gulf of Mexico in Miramar Beach a community of South Walton, this lovely, crescent-shaped resort property is a Destin landmark. The unique, curved architecture of this resort allows each condo to offer breathtaking views of both the beach and the community amenities. The two pools also offer these unbelievable views. During your sweet Southern stay be sure to take advantage of the lovely sundeck that is perfect for lounging as well as the hot tub, fitness center, boardwalk and many more resort amenities. The Crescent features elegant vacation rentals with fully equipped kitchens, whirlpool tubs, washers/dryers, a private balcony and a complimentary in-room safe. These one-, two, three-, and four-bedroom units each has its own private balcony, high ceilings, big windows, and a jetted tub that invites soaking. Amenities include two gulf-side pools — a large lagoon-style pool, a smaller pool that is heated seasonally, spacious sundeck with hot tub and gazebo, tropical landscaping, fitness center, BBQ grills and picnic area, game room, dune walkover, outdoor showers, conference facilities, covered parking and more. Crescent condos is located centrally to many Destin attractions including water sports rentals and area restaurants such as Pompano Joe’s and the Whale’s Tail. Shop our Southern Perks to enjoy exclusive discounts on many activities such as fishing, bike rentals and parasailing. When you are not down on the powder white sand beaches, venture out to experience some of the best shopping along the Gulf Coast at retail shopping center such as Silver Sands Premium Outlets and the Destin Commons are within walking distance, and supermarkets, restaurants, additional shopping, and other Destin attractions are just a few minutes’ drive away. You can also check out other Destin Area rentals.